The use of a single word in diplomacy can often mark a significant moment and the UN Secretary General Kofi Annan's use of the word "illegal" about the war in Iraq is one such moment. He has carefully avoided the word before. His previous phrasing was to say that the war was "not in conformity with the UN Charter". This was a typical diplomatic phrase designed to get over the meaning, but to avoid directness. It was not exactly a ringing phrase and Mr Annan was content with that. Now, in a BBC interview, he has been pressed into using the word "illegal" and that is the word which will now be used everywhere to describe his position. He has not changed his position. But his language has changed and that counts. It is worth noting that he still hedged the word round with references to the UN Charter, but that will be largely ignored. Diplomacy does not often like directness. Mr Annan is a diplomatic sort of diplomat. BBC: "So you don't think there was legal authority for the war." 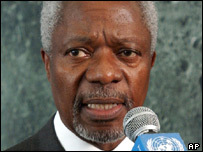 Mr Annan: "I have made it clear, I have stated clearly, that it was not in conformity with the UN Charter." Mr Annan: "Yes, if you wish." Mr Annan: "Yes, I've indicated that it was not in conformity with the UN Charter. From our point of view, from the charter point of view, it was illegal." The actual word was wrested from him as the final thing he said. He probably did not intend to say it, but found that he could not avoid it. So why does he think it illegal? In the interview, he remarked that Resolution 1441, passed on 8 November 2002, warned Iraq that there would be "serious consequences" if it did not comply with UN demands over its suspected weapons programmes. Mr Annan said it should have been left to the UN Security Council, in a second resolution, to determine what those consequences were. The United States and Britain argued they were carrying out the wishes of the Security Council and that their authority was based not just on Resolution 1441, but on previous UN resolutions. The British Attorney General, Lord Goldsmith, issued a public statement of his outline argument, though he did not publish, or even give the members of the cabinet, his detailed reasoning. He said the original Resolution 678 from 1990, which allowed for "all necessary means" to end Iraq's occupation of Kuwait and "restore international peace and security" in the region, still applied. It had been, he said, "revived" by Resolution 687 from 1991, which demanded that Iraq disarm. Since Resolution 1441 stated that Iraq was in breach of Resolution 687, the attorney general argued, there was authority to use force. For opponents of the Iraq war, the use of the word "illegal" will confirm their arguments in a satisfactory way. Supporters, including those who might not be wholly convinced by Lord Goldsmith's argument, might rely on the so-called Kosovo defence. The war by Nato against Serbia over Kosovo in 1999 was not authorised by the UN either, but was viewed by its proponents as a legitimate intervention to protect civilians. US Secretary of State Colin Powell used the word "genocide" last week to describe what has been going on in Darfur. A finding of genocide requires action under the UN Genocide Convention of 1948. The absence of words also matters. Resolution 242 after the 1967 war in the Middle East famously requires the "withdrawal of Israeli armed forces from territories occupied in the recent conflict". There is no "the" in front of "territories" and its absence has meant Israel can claim to be in compliance as it has withdrawn from some of the territories. Incidentally the French version says "des territoires" which does mean "from the territories" but this text is usually forgotten. The full Interview with Kofi Annan can be heard on the BBC World Service this Saturday at 03:30, 10:30, 17:30, 22:30 and again on Sunday at 01:30, 06:30, 07:30, 13:30, 19:30 GMT. "The arguments over the invasion's legality live on"